A nanotech company achieved 4x the leads by improving trade show strategy and pre- and post-show campaigns. Growing your business starts with creating awareness and need. You succeed when customers see the need, are aware of your solution and take action. That's not a given — the more complex the technology, the bigger the challenge. From branding to education to lead generation and supporting the close, marketing is about identifying, engaging and delighting the right customers. We start with the basics: why, when and how customers use your product or service. We're able to look at your market and opportunities, short and long-term, from the perspective of your customers, even your customers' customers, competition and sales force. We understand your technology, the sales dynamics and market drivers affecting your sales, and the proven keys to success of specific campaigns. Why? We're practical, customer- and results-focused, with broad and deep knowledge of the industries we serve. 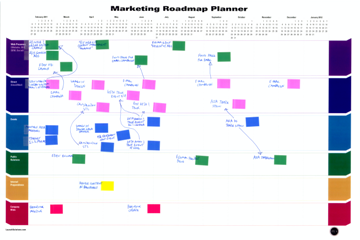 Use this tool to map our a capaign, product launch or even your marketing plan for the year.